I have been trying to build an IR repeater so I can hide my electronic equipment in a cabinet, but have had no luck. 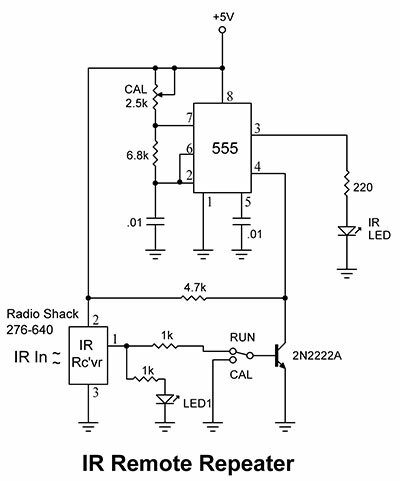 My first idea was just to use an IR receiver diode and transmit it back using a voltage follower. That did not work! So I went to the Internet and found a circuit using a 555, which also didn’t work. I am all out of ideas and I was hoping maybe you had a schematic or know where to find one. There were a few circuits in a previous issue, but in case you missed it, the figure below shows a copy of one of the repeaters. The beauty of this circuit is that the carrier frequency is adjustable via the CAL potentiometer, which allows you to use it with a wide range of IR senders. The visible LED (on pin 1 of the receiver module) can be used to tune the oscillator. Flip the RUN/CAL switch to the CAL position, position the IR LED in front of the IR receiver, and adjust the CAL pot until the visible LED lights brightly.